A 5-reel, 20 payline progressive slot Megajackpots Star Lanterns is a fun, interesting and very rewarding game. Its beautiful Chinese theme is captivating. This slot has many enthralling features that will make your play worth the money. IGT is the developer of this beautiful progressive slot and it is pretty evident that they have done a brilliant job with it. 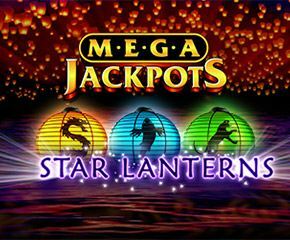 Megajackpots Star Lanterns is one of its few progressive slot games. Ever since 1981 IGT has ruled the online casino games industry. They are one of the oldest in the business and one of the most successful also. 2. If there is a combination that has been made. It will vanish and will be replaced by another symbol. This will keep happening until there are no more combinations possible. This is the Floating Reel Feature. A beautiful Red Lantern is the wild. The wild symbol can be substituted for any other symbol apart from the scatter symbol. 3. The scatter symbol is a Pink Lotus flower. The Free Spin Bonus is triggered by landing three of these scatter symbols on the 1, 2 and 3 reel. If this happens, you are shown three lanterns, you need to choose from one of them. The lantern you chose will have a number ranging from 4 to 14 and this will be your number of free spins. 4. There is a beautiful golden star symbol. This golden star symbol if appears one time on the real can reward you with 2x, 3x or 5x bonus which is chosen randomly. If it appears more than 3 times on reel 1, 2 and 3 then your multipliers are added to give you a bigger multiplier. This is the Star Multiplier Feature. 5. The Mega Jackpot is the biggest rewarding feature of the slot. If you land up with four Golden Stars in one spin you can get the Mega Jackpot. If this does not happen then there is a Second Chance feature as well. Megajackpots Star Lanterns slots is highly enjoyable and with all the special features and the mega jackpot, it is highly rewarding as well. All slot game lovers should definitely give it a try.